But the object is defeated when they flash, as the bulbs you get are orange! What I'm unsure of is the legality of red turn signals when they are not OEM and are not red plastic. I've seem lots of US cars with red turn signals but all were because the lense was red. 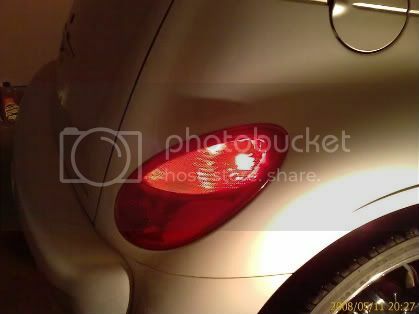 The red bulbs in the rear might be OK and might pass inspection (if you have an inspection in your state) as some new cars have the All-Chrome look in their taillights (Nissan Mirano comes to mind) and they blink whatever color bulb is placed inside. To find out for sure, check with your local inspection station. As far as taking the amber reflector out of the front headlights ....it's ILLEGAL to do so without replacing an amber reflector somewhere else on the font of the car that can be seen from the side. ALL cars and trucks must have an amber reflector in front and red reflector in the rear that will reflect side-coming headlights at night. Look at any car or truck on the road and somewhere in the front and back will be a reflector either by itself or built into the headlight or taillight. Look on the picture you posted and you can see the red reflector built into the lens itself. As far as taking the amber reflector out of the front headlights ....it's ILLEGAL to do so without replacing an amber reflector somewhere else on the font of the car . Can I replace the amber one with a white one though? Quoting from the Vehicle Handbook: Front clearance lamps, identification lamps and those marker lamps and reflectors mounted on the front or on the side near the front of the vehicle shall display or reflect an amber color. Do you have a state inspection of vehicles where you live? Last edited by CREWZIN; 12 May 2008 at 03:24 pm. Yearly MOT (Ministry of Transport) test in the uk for all vehicles but no need for reflectors on the fromt end of a car. I know all about the MOT as I spent 13 years in Harrogate, North Yorkshire. That was always a fun time trying to get an older car thru that test. Luckaly, a good friend and neighbor had his own garage and testing station so he'd help me get thru the tests each year with my Morris Minor, Mini, Anglia, Fiat, MG and a few American cars that I had over the years. 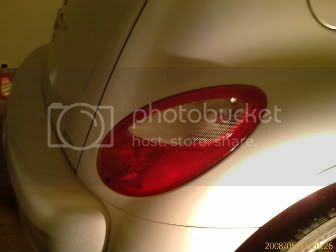 '06 tail lights. When I took my car to Jiffy Lube for an inspection, they tried to tell me red turn signals were illegal. As he was telling me this, a new Caddy pulled up and it had OEM red turn signals. The JL guy decided not to make me change bulbs. Had to get a power equalizer so the bulbs didn't blink so fast. Haven't had any problems with the bulbs or the cops (so far).